High school entrance exams during the Civil War era were hard, really. For arithmetic, 14-year-olds in Lowell, Massachusetts were asked to calculate the diameter of a cannon ball weighing 250 pounds, if the diameter of a 128-pound ball was 8 inches. In grammar, they were asked for the plurals of Mr. Smith, Miss Smith, and Dr. Brown. In the area of geography, they were asked to draw the Merrimack River and its branches, and locate the important towns on its banks. And in history, students were asked which European nation had been the first to acknowledge the independence of the American colonies, and to name the year in which it occurred. The man behind the questions was Abner J. Phipps, a Superintendent of Schools in Lowell. At a time when the very worth of his position was being questioned, Phipps was a firm believer in a good education for Lowell’s children. Phipps had been known to say that ‘a parent who sends his son into the world uneducated, does as great injury to mankind as to his own family; he defrauds the community of a useful citizen, and bequeaths to us a nuisance.’ He apparently extended this responsibility to the Lowell school system. The 1864-65 school year was Phipp’s second in the office. Abner Phipps was something of a superstar in the Massachusetts school superintendent circuit of the mid-1860’s. He had been superintendent of schools in New Bedford, Massachusetts for the four years prior to the same position coming open in Lowell. When that happened, very late in 1862, a committee including Lowell’s mayor and other local dignitaries short-listed Phipps and decided, unanimously, that he would be the best (and could really be the only) man to lead the city’s schools. But, would he accept? His contract in New Bedford had just been renewed, and, worse, when the committee approached him regarding Lowell’s superintendent post, he declined, saying the salary was too low. Lowell’s leaders were not deterred. Showing an ingenuity not possible today, Lowell’s Mayor Hocum Hosford proposed paying Phipps whatever salary he required, and Hosford himself would pay the difference from his own pocket. Phipps accepted and took up his post during the 1863-64 school year. A successful teacher with a solid track record in Massachusetts and a member of the State Board of Education, Phipps took a personal interest in the quality of instruction at Lowell’s High School. He personally prepared the questions delivered to eighth graders hoping for admission into Lowell High School and oversaw the grading of their answers. Thanks to the recent digitization of Lowell’s municipal documents at the Internet Archive, we can now see the questions that Abner Phipps developed for Lowell’s eighth graders. A sample of these questions have been reproduced below. During 1864, 140 children were given the examination; 122 passed. Of the 18 who failed, 14 were girls, 4 were boys. The average age of the students was slightly older than today’s children entering eighth grade: 14.1 years. Girls scored much better at spelling and grammar. Boys excelled at the remaining topics: reading, writing, arithmetic, history, and geography. Abner Phipps included the results of his most recent Lowell High School entrance examinations with his 1865 Superintendent’s Report. 1. What is the difference between 15 ÷ .15 and .15 ÷ 15? 2. If I should sell a wagon which cost me $85 for $95, on a credit of six months, what would be gained by the bargain, and how much per cent? 3. Divide $1800 among A, B, and C, so that A shall receive $150 more than B, and B $75 more than C.
8. What is the difference between half a cubic yard, and a cube whose edge is half a yard? 19. If the City of Lowell tax rate were 1.5 per cent, and the State and County tax were .18 of one per cent, for what sum would John Smith be taxed, who pays $143.46, including a $2.00 poll tax? 20. What will be the edge of a cubical box that will contain 216 times as much a box measuring 1 foot each way? 1. Write out correctly the following sentences: He could not learn me to write good. I never studied no grammar, but I can talk just as good as them that talk grammatical. Many a youth have ruined their prospects for life with one imprudent step. 2. Define a verb, and state the distinction between a transitive and an intransitive verb. 3. State the different ways of distinguishing between the sexes, and give an illustration of each. 8. What is a root? A prefix? A suffix? Illustrate by an example. 20. Write one sentence that shall contain all the different parts of speech, or as many of them as you can. 1. Through what waters must a vessel pass in sailing from New Orleans to Quebec? 3. What city is on the northwestern shore of Lake Ontario? 8. Which of the Southern States extends the furthest east? 19. Name the chief curiosities in Kentucky, Virginia, and California. 20. Name three gulfs on the north of Asia, and three on the south. 1. Describe the civil war in the colony of Virginia in 1676. 2. Who became King of England in 1685, and how was he regarded in England, and in the American colonies? Who succeeded him in 1689? 3. In what years were settlements commenced in the following places: Albany, Plymouth, Salem, Boston, Providence and New Haven? 8. What acts of parliament were passed in 1767, and how were these regarded by the colonists? 19. When and where did John Quincy Adams die? How many years had he been employed in the service of our country? 20. What remarkable events took place on the 4th of July, 1826? Abner J. Phipps’ questions were difficult, and must have been difficult for graduating eighth-graders hoping for admission into Lowell’s high school during the wake of the US Civil War. 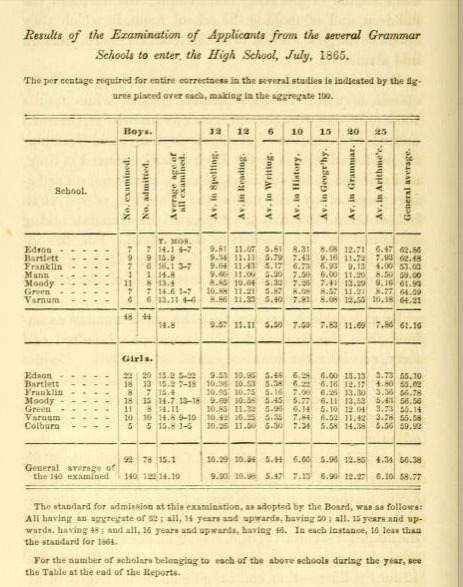 Students, in 1865, scored worst in the areas of arithmetic (24% correct), geography (46% correct), and grammar (62% correct). Their strongest areas were reading (92% correct), writing (91% correct) and spelling (83% correct). Some differences emerged across Lowell’s different schools, and others between the genders (as shown in the above graph). Abner J. Phipps didn’t stay long as Lowell’s school superintendent, leaving before the completion of his third year when he was named Agent of the Massachusetts Board of Education. In the School Committee’s report for 1867, his short tenure in Lowell was memorialized. Oh wow. Not only would my students never pass this, I wouldn’t either! I got all the math section done and realized you didn’t have the answers listed. Let me know if you have the answers some where as I’d love to do the whole thing and see how I score. I’m confident in the math but history . . . yikes! Alas, Abner J. Phipps, didn’t post the answers to his entrance exam in his superintendent’s report, just the questions. I think an answer key could be the subject of an entirely separate post. I would have failed the entrance exam to high school. So much for my college education. Me too – I was surprised by the difficulty of the questions!